I head back to work on Monday and I'm excited for the year ahead. What I'm not excited about is the daily struggle of trying to find something to wear. For months I've been trying to stretch a handful of separates (both me made and RTW) and it's been really frustrating. I have enough to be appropriately clothed. I don't have enough to only wear things I feel good in or to change my mind if I don't feel like wearing a particular item. It's a total first world problem but it's not a great way to start the day. Clearly my sewing time has been devoted to casual sewing for too long. So my focus for January is sewing more work wear. 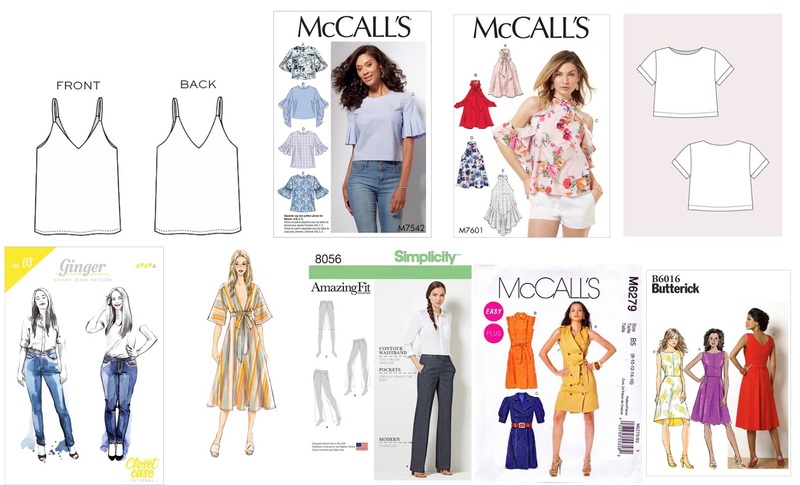 I pulled these patterns and I've already made a start, I've cut three silk camis, a white linen Inari tee and a pair of Ginger jeans in black drill (these are a total wardrobe workhorse for me). I need to muslin the McCall's dress and hope to make a start on it soon. The best part is that all the fabric and patterns are already in my stash! I'm not locking myself into these patterns but I am focusing on pieces for work. Also, if you have any work wear blogs or Instagram accounts that you love please share - I'd love some more inspiration! Do you struggle with what to wear to work? Do you make your work clothes? If you do, what are some of your favourite patterns? I sew a lot of Burda mag patterns but their sizing just works so well for me. I have a TNT skirt pattern (B5760) and 2 TNT pants patterns (V9032 and S2700 and soon to be Burda 6432!) . I love wearing jackets/blazers so I sew a lot of shells/sleeveless tops. I AM realizing I want more color in my winter wardrobe than I usually have. I actually sew work clothes almost exclusively. I like to sew in mini capsules, so 2 skirts and 3 shirts and a jacket or some mix. I just find this allows you a little mix and match- so you are not wearing the same 2 pieces together. You have a little flexibility. That and ponte knit dresses are wonderful, they can be very work appropriate but they are stinking comfortable! I have work in three places, two have a uniform shirt. I hate them! I'd much rather choose my own clothing. I make my own trousers and tops for the third workplace. This year I am making more. I have to focus on lighter clothing as all my work sites are warm and I move a lot in my job. A jacket would be nice too. I tend to focus on plain navy or black trousers that will work with any colour top. Then tops in colours and prints that suit me. I make a lot of my work clothing. I work in a corporate environment that is not super dressy. I actually wore M7542 today. It is a great work top. I also have a lot of Sewaholic Renfrew's and Grainline Studio Larks that I wear in Winter. I mostly wear skirt, not pants, and M7631 is my go to. I also have a lot of Colette Laurel's in both knit and woven. They are a real workhorse for me. I have the Grainline Morris Jacket and Sew to Grow Bespoke blazer, but have not made either as yet. However they are both on my to do list this year. Good luck with your sewing. I look forward to seeing your makes.